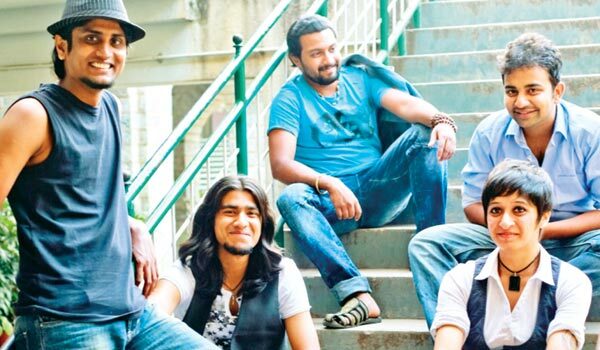 Featuring a mix of Hindi and Kannada, Bengaluru-based fusion/Indie rock band Lagori is coming to town this weekend with their five-member band. Comprising singer Tejas Shankar, guitarists Geeth Vaz,A� Edward Rasquinha and Shalini Mohan (bass), and drummer Vinyl Kumar, ask them what genre they classify themselves under and Shankar says, a�?Some say wea��re a fusion band, others call it Indie rock. Considering our music is melodious and high in energy, I call it the happy genre. We want people to go back happy after our performance.a�? Having got together in 2011, the band released their first album in 2013. a�?The name Lagori is a reflection of our roots. Ita��s inspired by the game played with seven stones in the streets of India, and here Lagori represents the seven notes in music,a�? says the singer, about the band that has been in the news for plenty of reasons over the years. They were featured in the third season of the music-art collaboration, The Dewarists, along with a theatre group from Mumbai, Actorsa�� Cult, which resulted in the song, Hadimba. In 2013, the band also had a traffic-stopping moment as they performed in Bengalurua��s Brigade Road in peak hour traffic. They have also been featured on Music Mojo for Keralaa��s Kappa TV audience, where they say they have received a lot of love. The team has made it to several music festivals like NH7 and recently collaborated with an EDM act, Above and Beyond, on the track, Wea��re all we need. Though theya��ve performed in the city a few times, Shankar says, a�?The audience has been very appreciative and we want to return the love. So, apart from our popular tracks like Boom Shankar, our fans can expect a few other surprises.a�? Speaking about the music scene, he says ita��s a great time for independent artistes in the country. a�?There is space for all kinds of music now and making a career in it is more lucrative than it used to be,a�? he adds. Their next album has been slotted for 2016, but this year will see a lot of singles being released. They recently unveiled their own brand of beer (Indiaa��s first band to brew its own) in collaboration with Big Brewsky in Sarjapur Road and have named it Lagori Amber Witbier. They most definitely know how to grab headlines and we say cheers to that!